← Systems thinking for middle managers: workplace democracy in action. I read this HBR blog and thought about how it could be applied to complaints. When a problem occurs, an organisation will often wait until someone before trying to fix the issue. As most organisations do not work actively to prevent or pre-empt complains, the complaint becomes an important improvement tool. Yet, when the customer does decide to make a complaint, they are often faced with the standard complaints or contact page. There is rarely, if ever, an effort to help the customer complain properly or in a way that helps the organisation. How organisations signpost complaints procedure tells you their value. What we find are complaints pages or forms that have free text fields or contact details of the complaints team. Some organisations have an online form that has some questions to prompt a better complain. The standard approach is to ask the person complaining to explain the problem, give some details for context and to explain what they want done. The organisation hopes customers will use this online form and make a clear and concise complaint. Alas, this is hardly, if ever, the case. Instead, something like the following occurs. The complainant decides to write a long letter, usually by hand, so you know immediately they are not going to use the online form. In some case, they may type an even longer letter or email. Usually the complaint wanders over various topics, and expresses personal attacks. Such complaints are usually poorly constructed and usually not well written. The reader struggles to understand the complaint, the issue and struggles further to consider what might resolve the issue. Invariably they end up it finding a solution that best fits what the organisation wants. In many complaints, the organisations gets caught up with the extraneous, emotive issues like insults, and fail to recognise or resolve the problem. They focus on the complaint and not the problem. As a result, the complaint and not the problem becomes the issue. What I have never seen, which is why I am proposing it, is an organisation that educates its clients and customers on how to make a complaint. By that, I do not mean explaining how to register a complaint. I mean educating the customer on the best way to write a complaint letter. I have never seen an organisation give advice and help or even a link to material to help the customer complain. I understand why most organisations will resist or reject this approach. Many senior managers view customer complaints as a hassle to be avoided. In many organisations, the complaints are seen as something to be minimized because they see the customer as the problem. The customer is a problem client, or a serial complainer. If they show the organisation was at fault, then it becomes defensive. Yet, by educating the public on how to complain, they could help themselves in a number of ways. How educating the customer to complain can help your company. First, it would show a commitment to customer service. Such an approach suggests an organisation confident of its complaints handling. At the same time, it shows an organisation that is willing to learn. Second, the organisation would get better complaint letters. The letters would more likely to be polite, focused, and propose a solution. (See the list below for links to various web sites with advice on how to write a complaint letter). Third, the complaint letters would be structured. An on-line form can capture the main points with systematic instructions on what is required. If the complaints are structured, they are easier to direct to the appropriate team. Fourth, the process allows you to triage complaints and prioritize them. If you educate the public on how to complain, you can suggest your preferred style. With a preferred style, form or structure, the organisation can triage complaints and prioritize them. For example, if you use a form or required structure, then you can indicate that a concise complaint will get a quicker response than one that rambles and does not have a coherent structure. Fifth, a structured approach focuses on the substantive points rather than secondary issues. The letter focuses on the proposed solution. The focus changes from the complaint to the substantive issue: the problem to be solved and the proposed solution. Sixth, the proposed solution means that you do not have to solve the problem yourself. You are looking at how to make the solution happen. If you cannot solve the problem, then you discuss the proposed solution. By proposing a solution, it saves the organisation from having to expend a lot of effort trying to propose a solution that the customer will not find satisfactory. I cannot guarantee this approach will transform customer complaints. However, it would help to reduce the 20 page letters and it would help to find solutions. Most importantly, it would help to find learning outcomes for the organisation. The learning outcomes will be derived from the proposed solutions. By improving complaints, you can save money as the customer helps you to improve. Please note that this is different from “feedback” or “customer engagement”. Instead, this is about the point at which a complaint is going to be prepared and developing a way to make it easier for the customer and develop it as a learning tool for the organisation. 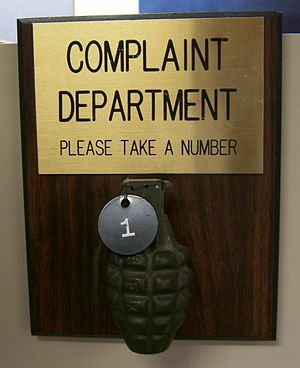 The following list of sites on how to complain was chosen at random from the internet. I am not endorsing them nor do I have an interest in them. This entry was posted in customer service, management and tagged Company, Complaint, Customer, Customer experience, Customer Management, customer service, Facebook, Twitter. Bookmark the permalink. Despite that, I am not sure that it’s helpful to think about them as completely distinct categories, for either the individual or the organisation. From an inidividual’s point of vew, it is not at all clear that that is how they [we] think. According to Patient Opinion’s own research, most people complain because they want the service to be better, not because they want some form of personal redress. Take a recent Patient Opinion story, which they flagged on twitter yesterday. Is that a complaint? Might it have become a complaint had it received a different kind of response, or no response? I am not sure that those are even useful questions to be asking. From an organisation’s point of view, labelling conversations as complaints sets them up to be negative. Some of course will be so or become so. But labelling something a complaints department more or less sets it up to be a defensive bunker. It also pretty much guarantees that the problems will be bigger and more intractable by the time they get there. It’s much better to have a system – and people – ready to pick up small glitches and sort them out as part of the flow of normal work. I have had to read – and deal with – some of the twenty page letters in my time. There was not a single one of those cases where the twenty page letter was the first attempt to communicate – it was often the third or fourth. Typically, two pages were about whatever the initial problem had been, and the remaining 18 were about how the organisation had failed to recognise and address the problem when it first arose. So I agree with pretty much everything you say about improving the quality of complaints. But I suspect that the more people are encouraged and supported to tell the story of their experience, the more it wil be possible to distill the messages both about fixing things for the individual and about lessons for the organisation. Labelling things as complaints too early may make that harder than it need be. Thanks for a detailed response. I will revise to clarify the point about feedback and engagement. I was thinking that complaints are already self identified by the customer. Thus, the issue has reached the point of complaint. I agree that organisations can be better at communication, as most people want a dialogue not a monologue. The challenge though is that for many organisations, the complaints process is the only dialogue process. I agree on the 20 page letter issue. However, they could be prevented if the first letters, that were not complaints, were framed like good compalint letters. Again, few if any organisatiosn explain the best what is effective communication. Having looked at the NHS system and studied complaints, most people want to be heard, they want their views to be considered, and they want the process improved or at least clear explanation as to why it cannot be changed. When you speak of telling the story, I think that this is different from a complaint because someone may have an issue, why were the lights out last week, that may become a complaint or it may become a service request for improved lighting. If they are not able to tell their story, or the story does not lead to a response, or the response falls short, then it becomes a complaint. In that regard, the organisation can prevent or pre-empt complaints, but that is only if it is a listening and learning organisation. The problem, as you correctly point out, is that too often complaints is the only form of engagement or opportunity for feedback. My concern in differentiating them is that organisations will do surveys, consultations, and feedback yet never do anything about them because they are only used as justification for what was already intended. Thus, a complaint then becomes the only way for service improvement. A learning organisation will see a complaint as a learning opportunity. In most cases, though, it will be seen as a hassle because it suggests that the organisation’s view is wrong or was not correct or needs to be changed. As we know from history organisations do not like to change and they do not like to change. The market may change them, but not all organisations face a market discipline. Thanks again for an excellent and stimulating comment. I think you have put your finger on the key point: organisations which can listen and learn sufficiently that stories do not become complaints are the ideal. Achieving that ideal is a daunting challenge.